Thousands of teachers and supporters hold signs in the rain during a rally, Jan. 14, 2019, in Los Angeles. Tens of thousands of Los Angeles teachers went on strike Monday for the first time in three decades after contract negotiations failed. Negotiators for 30,000 striking Los Angeles teachers and America’s second-largest school district have agreed to return to the bargaining table Thursday, with Mayor Eric Garcetti acting as mediator, his office said. Wednesday’s announcement of the breakthrough capped the third day of a strike that has disrupted classes for nearly 500,000 students as teachers pressed their demands for higher pay, smaller classes and more support staff. Representatives of the two sides, the Los Angeles Unified School District and the United Teachers Los Angeles, have not met since union leaders rejected the LAUSD’s latest contract offer last Friday night, setting the stage for district teachers’ first strike in 30 years. There was no immediate word from district officials to the overture for mediated talks, first unveiled by union leaders at a Wednesday night news conference. But Garcetti’s office confirmed that both sides had agreed to resume face-to-face sessions Thursday. Actor, musician and activist, Steven Van Zandt, center, supports striking teachers on the picket in front of Hamilton High School in Los Angeles, Jan. 16, 2019. Union officials said the mayor, who has voiced support for the teachers’ cause, had met with the two parties Wednesday. California’s top education official, its superintendent of public instruction, Tony Thurmond, “has also been in touch with both parties and offered support,” Arlene Inouye, chair of the union’s bargaining team, told reporters. Thurmond could help to secure extra funding the district may need to close a deal. LAUSD Superintendent Austin Beutner has said the teachers’ demands would strain the budget too much. United Teachers Los Angeles President Alex Caputo-Pearl said the union was counting on Thurmond and Garcetti to make the case that funding could be found. The teachers, who have been without a contract for nearly a year, walked off the job Monday. School district officials have kept all 1,200 schools open on a limited basis with a skeleton staff, but attendance has been about a third of normal. Thousands of striking teachers joined in boisterous rallies and pickets across the sprawling school district Wednesday, although a third day of showers seemed unable to dampen their spirits, or those of parents who turned out in support. Huddled under an umbrella in a downpour, Diana Castillo, a teacher at Harbor City Elementary School, said she discounted assertions by Beutner, a former publisher and investment banker, that the district could not afford the union’s demands. She added, “We spend so much of our own money just to make the classrooms look presentable,” and cited a lack of on-site nurses and instructors in art, music and physical education. The Los Angeles walkout follows a wave of teachers’ strikes last year across the United States over pay and school funding, including work stoppages in West Virginia, Kentucky, Oklahoma and Arizona. 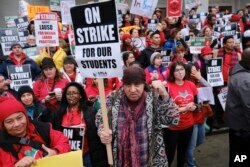 Those represented battles between teachers’ unions and Republican-dominated state governments focused on cutting costs, while the Los Angeles strike is unfolding in a Democratic-controlled state. Denver teachers could vote to strike by Saturday if no deal on a new contract is reached. Los Angeles Unified School District Superintendent Austin Beutner, left, and board president Monica Garcia wait in the hallway for a news conference at the LAUSD headquarters, Jan. 15, 2019, in Los Angeles. Beutner said the district had proposed staff increases that would cost $130 million a year — more than county officials have said is available — while the union’s demands would cost $800 million. The union wants a pay rise of 6.5 percent, but the district has offered a 6 percent hike with back pay. LAUSD teacher pay now averages $75,000, state figures show.